Alejandro Jodorowsky burst into world cinemas with the cultiest of 70's cult films - El Topo and The Holy Mountain . I have seen The Holy Mountain (my review) and it was clear to me that Jodorowsky was a director with a great visual sense who had - how to put it? - a very different sense of reality than most of us. When I heard that somebody had made a documentary about Jodorowsky's attempt to film Dune I knew I had to see it. Jodorowsky spent 2 years on the project, collecting his "spiritual warriors" to make what was to be a landmark project designed to expanded the consciousness of cinema-goers around the world. His casting was inspired - Mick Jagger as Feyd-Rautha, Dali as Leto, and "Baron Harkonnen is grotesque, fat and disgusting : Orson Wells!". He also had an eye for artistic talent, gathering SFX genius Dan O'Bannon, and artists H.R. Giger and Chris Foss (who together went on to make Alien) along with others to produce the whole film in book form to show to American film studios. Jodorowsky's Dune mainly consists of Jodorowsky speaking about the project, with frequent cut aways to most of the other warriors, who all seem genuinely pleased to have been involved in such a huge but doomed undertaking. It is easy to see how Jodorowsky managed to woo people to his quest, he is a magnetic speaker and his enthusiasm is infectious even if much of what he says is crazy. It is lucky for the world that all he wanted to do was create films; as a politician or religious leader Jodorowsky would be dangerous. Although not a single frame of film was shot, the complete storyboard was compiled and Jodorowshy's Dune animates portions to show what the finished product would have looked like, backed by an an appropriately 70's synth soundtrack. Jodorowsky is certain that he was on track to make a masterpiece, and I am not sure he is wrong. Maybe that film exists in another, better timeline. Instead, in this timeline we got 80s Dune. David Lynch instead of Jodorowsky. Sting instead of Mick Jagger. Toto instead of Pink Floyd. These are not positive changes. Coke Zero instead of the original coca-infused Coke. Jodorowsky's face lights up (more than usual) as he recounts seeing the film and realising it was a horrible failure. 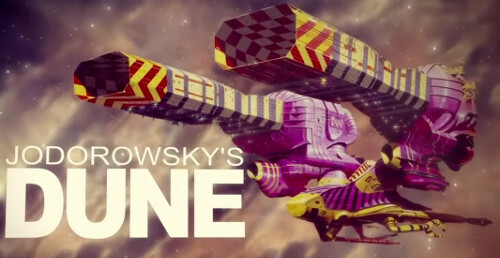 Jodorowsky's Dune is a fascinating and often hilarious look into a project that was just to big for this world. Jodorowsky is the perfect subject, jabbering on in charmingly broken English about his film and his philosophy. By turns hilarious and draw-droppingly mad, Jodorowsky's Dune is highly recommended. Jodorowsky has a new film out soon - I'll probably see it.